Welcome to the year 6 area, we have an exciting year planned for your child and hope they enjoy their journey with us. Other adults working in the year group are;Miss Cawe, Mrs Habert, Mrs Habib, Miss Lacey, Mrs Lucas, Mr Lysandrou, Mrs Makani and Mrs Stacey. Please ensure that your child has their PE Kit at school every Monday ready for their two PE lessons. The children will be given three pieces of homework each week. All pieces of homework are due every Wednesday. We would also recommend that the children read every night for at least ten minutes and practise their timetables when possible. Spelling homework goes home on Friday. English homework goes home on Friday. Maths homework goes home on Friday. Can you design and make your own fighter jet? Can you create a fact file about children in WW2? Can you research the different types of animals and create an information poster? Oranges in No Man's Land, is the moving story of a young girl trying to help her family amid the crisis of civil war. Since her father left Lebanon to find work and her mother tragically died in a shell attack, ten-year-old Ayesha has been living in the bomb-ravaged city of Beirut with her granny and her two younger brothers. The city has been torn in half by civil war and a desolate, dangerous no man's land divides the two sides. Only militiamen and tanks dare enter this deadly zone, but when Granny falls desperately ill Ayesha sets off on a terrifying journey to reach a doctor living in enemy territory. 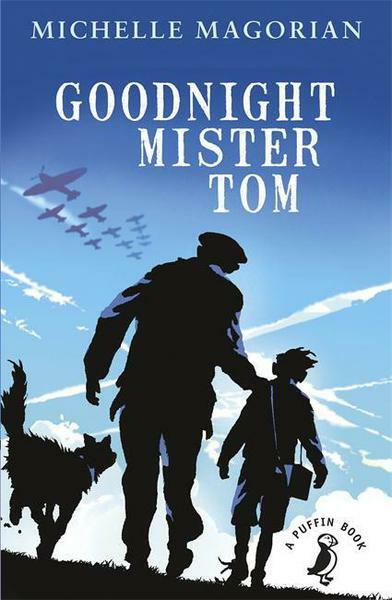 The children will be focusing their World War Two learning on the novel, Goodnight Mister Tom by Michelle Magorian. The story conveys how Britain is on the brink of war when young William Beech is sent to live with Tom Oakley in the village of Little Weirwold. Tom Oakley is a sad, reclusive widower who slowly accepts the idea of having the boy live with him. Tom soon discovers William has been a victim of child abuse and greatly needs his love and care. The children will be continuing their learning centered around World War Two, they will be exploring different perspectives during the war through two wartime stories; Germans in the Woods and Rose Blanche. Germans in the Woods is a short text. Joseph Robertson was an infantryman in the U.S. Army during World War II, where he fought in the Battle of the Bulge. The stark black and white images in this short haunt the viewer, just as Robertson is haunted by his memories from that battle. To watch the video clip, click　here. This half term we will be following a Power of Reading text ,'The Viewer'. The book tells the story of a curious boy named Tristan, who enjoys exploring dump yards. During one trip Tristan finds a unique wooded box, which is locked. When he arrives home, the box unlocks and inside is a viewer. Tristan looks in to the view and sees mystery, death and destruction - images that haunt him during the night. The children will explore the fascinating text, Oranges in No Man's Land, through; role play, research, fact file writing tasks and exploration of language. In addition, we will be using the epic story of Oranges in No Man's Land as our writing stimulus for our own writing, we will include a range of sentence types and new and exciting vocabulary and punctuation, as well as figurative language. The children will be writing letters, in role, as William Beech; an evacuated child from World War Two. In addition, the children will use role play, freeze frames and role on the wall to fully understand what life was like during this turbulent time. The children will be exploring figurative language by writing their own poems using　Rose Blanche and German in the Woods as their stimuli. Year 6 will also be creating freeze-frames, working collaboratively, using reciprocity to show empathy by exploring characters. In addition to this, we will be writing letters to a loved one explaining our actions during war time and how this can continue to affect someone's life forever. Year 6 will also be using a range of non - fiction texts to gather information about WW2 to create their own information texts. The children will be using drama to empathise with a character, using figurative language to describe a setting from the the text, ' The Viewer'. We will also be interviewing the main character, where we will then create our own newspaper reports. In addition to this, we will be retelling another characters point of view by creating our own versions of The Viewer. During SPaG lessons, we will be revisiting topics in order to revise for the SATs. This half term, we will be exploring the following topics in Maths; place value, ordering numbers to ten million, rounding, negative numbers, written methods for addition and subtraction and a range of mental strategies. We will do this through, mental arithmetic tests, using various apparatus and pictorial representations. This half term, we will be exploring the following topics in Maths; the four operations, word problems, fractions, percentages and a range of mental strategies. This will be achieved through, mental arithmetic tests, using various apparatus and pictorial representations. This half term, we will be recapping; the four operations, word problems, fractions, percentages and a range of mental strategies. We will also move on to simplifying fractions, adding/subtracting fractions, fractions and decimal equivalents and ratio and proportion. This will be achieved through, mental arithmetic tests, using various apparatus and pictorial representations. As the SATs are approaching, we are focusing our learning on the remaining topics such as; area, volume and perimeter, algebra, translation, reflections and co-ordinates. In addition to this, we will be consolidating the children's learning so they are able to achieve their best! In Science this half term, we will be focusing our learning on Evolution and Inheritance. We will be looking Charles Darwin’s theory of evolution and survival of the fittest and whether there is sufficient evidence to support his theory. As well as this, we will be looking at working scientifically, making predictions, planning fair tests and experiments and recording data and observations. In Science this half term, we will be focusing our learning on Living things and their habitats. We will be looking into classifying animals, mammals, amphibians, reptiles, fish, insects, birds, food chains, classification keys and micro-organisms. As well as this, we will be looking at working scientifically, making predictions, planning fair tests and experiments and recording data and observations. In Science this half term, we will be focusing our learning on　Living things and their habitats. We will be looking into classifying animals, mammals, amphibians, reptiles, fish, insects, birds, food chains, classification keys and micro-organisms. As well as this, we will be looking at working scientifically, making predictions, planning fair tests and experiments and recording data and observations. The children are continuing to revise the main units of the curriculum both through practical activities and written tasks. The children are now able to answer a range of SATs based questions on these key areas that have been covered. We will be mainly focusing on; solids, liquids and gases and the Earth, Moon and Sun...so please try to revise these units at home. In indoor PE this half term, the children will be learning all about gymnastics (synchronisation and cannon) to perform difficult combinations fluently with control and be working in a team to judge and evaluate others performances. In outdoor PE, the children will be focusing their learning on invasion games such as netball and basketball, where they will choose when and how to pass, so that their team keep possession, use attacking and defending skills appropriately in games, know the importance of being fit as well as what types of fitness are most important when playing Netball, planning and leading skill practices for Netball, identifying aspects of their own and others’ performances that need improvement, and suggest how to improve them and plan and use tactics with a team to be successful in a Hi-Five game. In indoor PE this half term, the children will be learning all about dance. They will effectively respond to a range of stimuli, improvising freely using a range of controlled movements and patterns and select and use a range of compositional ideas to create motifs that demonstrate my ideas. In outdoor PE, the children will be focusing their learning on invasion games such as hockey and football. By the end of the half term, the children will successfully choose when to pass or run with the ball, so that they keep possession and make progress towards the goal, perform football skills with greater speed, recognise and describe the best points in an individual’s and a team’s performance, identify aspects of their own and others’ performances that need improvement, and suggest how to improve them and organise ideas to be more successful. In indoor PE this half term, the children will exploring dance. They will explore dance and movement ideas imaginatively, including actions, dynamics, space and relationship, perform with clarity and sensitivity to an accompaniment (e.g. percussion, rap), communicating a dance idea and identifying what types of exercise is need to help improve in dance. In outdoor PE the children will be learning how to play tag rugby. They will use a variety of tactics to keep possession of a ball, (e.g changing speed and direction) and to move to a scoring position, organising teams to think of ideas to be more successful and recognise and describe the best points in an individual's and a team's performance. In indoor PE, the children will be learning about 'Barriers and Holes' in gymnastics. They will make up longer sequences and perform them with fluency and clarity of movement, learn how to improve their health and fitness as well as knowing how gymnastic activities helps contribute to this, determine judging criteria for a gymnastic performance with a team of judges and use those criteria to feedback on the performances of others. In outdoor PE, the children will be focusing their learning on Athletics. The children will sustain their pace over different distances, perform a range of jumps showing power control at both take-off and landing, explore different ways of exchanging a baton and choose which technique works best, explain why some athletics activities can improve strength; power or stamina, measure how long or high they can jump, organise and manage an athletic event, watch a partner’s performance and identify strengths and suggest improvements and set a personal challenge and improve on their performance. Year 6 will be reviewing the online safety rules and completing the pupil online safety acceptable use agreement form. The whole class will also sign a ‘Queenswell Online Safety Rules’ for display in class. In addition to this, the children will take on an iPad project that will be based on their Learning Journey topic Shackleton’s Journey. This half term, the children will be using Espresso Coding where they will be learning about using variables in more complex ways and to manipulate inputs to create useful outputs. In addition, the children will use iPads to research World War Two events. In this coding unit pupils learn to use variables in more complex ways, and to manipulate inputs to create useful outputs. Children will solve maths challenges using variables and loops, use algebraic formula in their code to perform calculations which use variables, create their own app and carry out debugging exercises to fix the mistakes in the code. This half term, we will be learning about sketching and pencil skills where we will learn how and why to add tone and texture. In art this half term, we will be carrying out a still life using World War Two artefacts and a Blitz style painting with a silhouette of London in 1940. In D&T, we will be using cookery skills to recreate recipes from WW2. In art the children will be studying a range of artistic techniques and styles. This will be achieved through; screen printing, sketching, paint work, exploring the outdoors and using outdoor resources and cooking. We will also be looking at mechanisms which we will use to create our own viewers. This half term, your child will be using terminology, facts and examples accurately to display their understanding of the impact of how the world has and is changing through human impact. This half term, your child will be using terminology, facts and examples accurately to display their understanding of the impact of World War Two on the world and our lives. In addition, the children will take part in a ‘History Off the Page’ day where they will take on the role of a child during the 1940’s. This half term, your child will be using terminology, facts and examples accurately to display their understanding of the impact of World War Two on the world and our lives. In addition, the children will look at the role of women during the war, the impact of the Holocaust, research and learn about Anne Frank and propaganda. The children will be completing their own research about ancient civilisation. They will be researching facts and events of a historical period, where they will use these to create their own mini projects. In music this term, your child will be learning advance instrumental and rhythmical music skills and will show an understanding of musical vocabulary. The children will also, learn lyrics and preparation for recitals. In music this term, your child will be learning further instrumental and rhythmical music skills and will show an understanding of musical vocabulary. The children will also, learn lyrics and preparation for recitals. In Spanish this term, the children will be writing about themselves, this will include: their name, how old they are, their favourite colour and where they live. In addition, they will learn question words and conjunctions which they will use to extend their sentences. In Spanish this term, the children will be continuing to write about themselves, including; their name, how old they are, their favourite colour and where they live. In addition, they will be using question words and conjunctions to extend their sentences and they will be learning some facts about Spain, the city of Barcelona and the Spanish architect Gaudi. In RE this term, we will be focusing on key words linked to discrimination and prejudice that would have been used during the 1940s. In addition, we will be learning about religious journey made for the six main religions and compare them for similarities. The children will be learning about important places of pilgrimages for a range of religions, where they will develop their understanding of rituals that happen as well as comparing these for differences and similarities. They will also be learning about different places of worship and practises that happen in them. The children will be learning about the journey of life and death in different religions. We will be identifying the beliefs of what happens after death and focus on the rituals that occur during a Hindu wedding. We will also be researching important milestones during your life for different religions. The children will continue to learn about the importance of life and death. We will be focusing on the 10 commandments and their importance. We will also be learning about Baptism and Bar Mitzvah. The children will also learning about the importance of marriage in the 6 main religions.